Kulukki sarbath / shaken lemonade is a very popular drink, especially in Kerala. Kulukki sarbath is one of the best thirst quenchers to beat the summer heat. 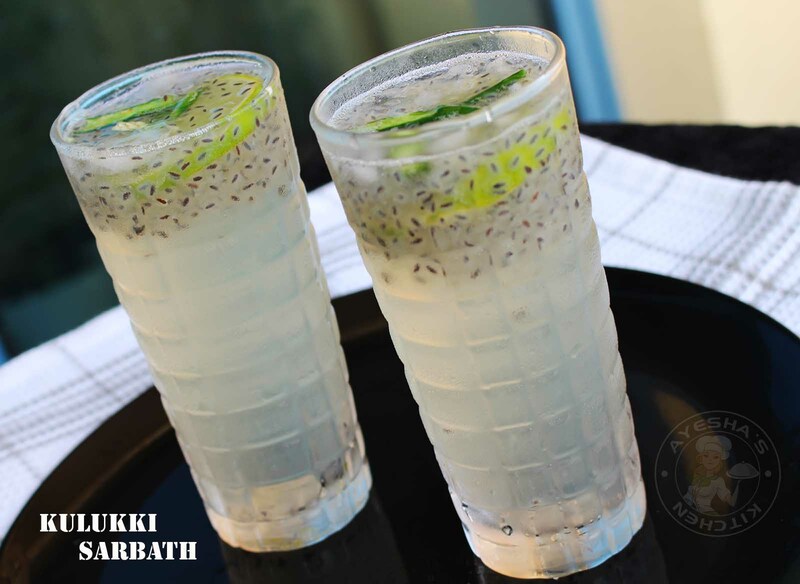 A traditional drink of Malabar which is made using handy ingredients. The whole ingredients are added to a container with lid or cocktail bottle and then it is shaken for a minute or more for a perfect lemonade that than quench your thirst within seconds. Green chilies are added for a bit spiciness, so add this only as per your preference. 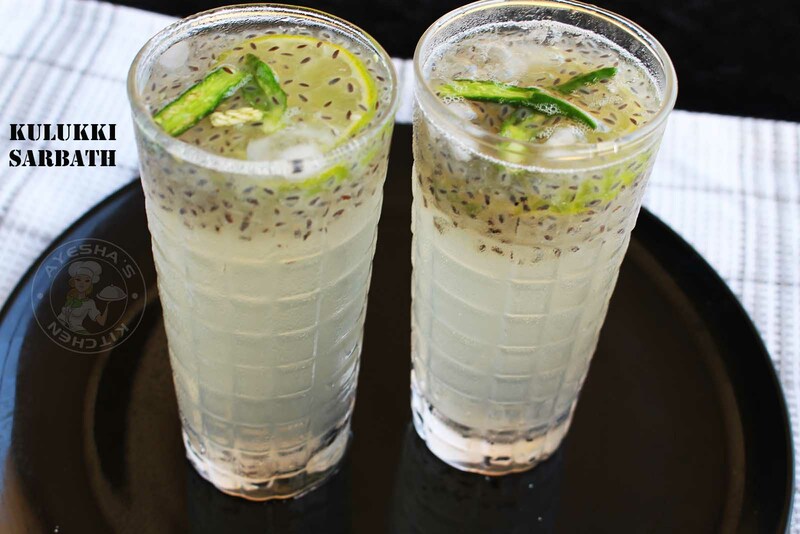 The sabja / basil seed / kaskas (cuscus) adds extra cooling and texture for this drink. Here instead of sugar, we are using sugar syrup only. So never compromise on adding sugar syrup. It is a must for this lemonade recipe. Do try this sarbath today itself. It's worth a try. 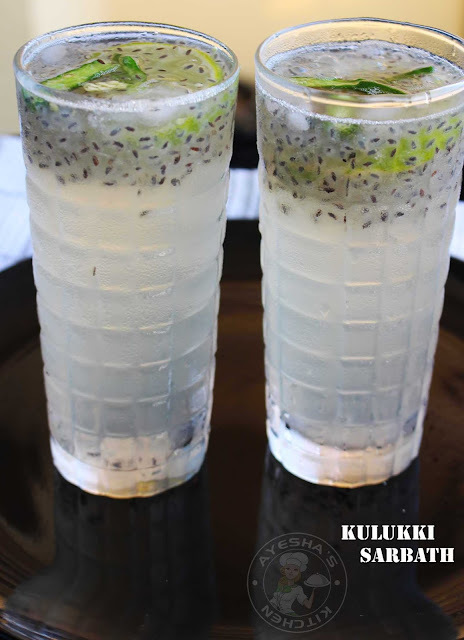 Soak sabja seeds or basil seeds or kuskus in a cup of water for 10 minutes. Always soak in enough water to avoid stickiness. (You can also prepare this in the previous day, drain it and keep refrigerated in an airtight container. so that you can prepare this drink instantly. This basil seed can be refrigerated for 3 days) . When done, set aside. Make the sugar syrup. Add sugar and water in equal quantity and allow it to boil until the sugar melts. Stir well with a spoon. No need to make thick syrup or one string consistency. (You can also prepare this syrup in advance so that you can make this instantly). Once done, allow it to cool or keep refrigerated for a while. Let's start making kulukki sarbath!!! For that, you need a cocktail container or a bottle with lid for the purpose of shaking. Add the prepared sugar syrup to this container. And then add two tablespoons of soaked sabja seeds / basil seeds / kuskus. (After soaking it will double its size, so add only as you required). Then add lemon juice. I took the juice of a big lemon. Almost 3 tablespoons. Add as per the sourness of the lemon. Then add green chilies slit, ice cubes and lemon slices. You can add little water if required. Close the lid and shake very well for a minute or more.